To properly manage college costs, you need to understand the real price tag of a higher education, including hidden fees that surprise students after they enroll in a college or university. 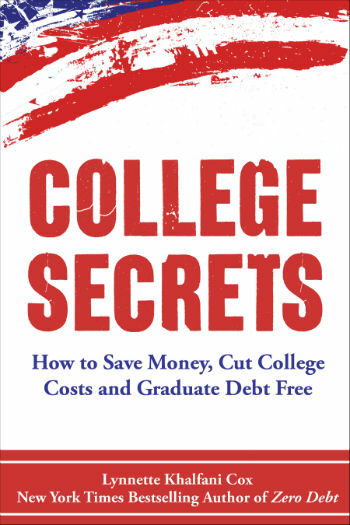 College Secrets and its companion book, College Secrets for Teens, reveal the true costs of earning a college degree – and then provides hundreds of money-saving ideas to help students and parents reduce or eliminate these expenses. College Secrets can save you $20,000 to $200,000 over the course of a four-year education. 15 common mistakes that reduce your financial aid … and much, much more! The College Secrets series is your roadmap to paying for college the smart way – with some sanity, truth and planning in the process, and without going broke or winding up deep in debt. Lynnette Khalfani Cox, The Money Coach®, is a personal finance expert, television and radio personality, and the author of numerous books, including the New York Times bestseller Zero Debt: The Ultimate Guide to Financial Freedom. Lynnette is a former Wall Street Journal reporter for CNBC, who now teaches individuals nationwide how to better manage their finances. She lives in New Jersey with her husband, Earl Cox, and their three children. Follow Lynnette on Twitter @themoneycoach or learn more about Lynnette at AskTheMoneyCoach.com.